Next Show: Thur. 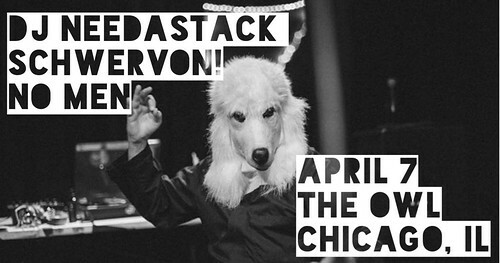 April 7 / Chicago, IL @ The Owl w/ DJ Need A Stack (Bob Nastanovich of Pavement/Silver Jews) + No Men | Schwervon! Before Bob Nastanovich joined Pavement for their first live tour in 1990 or was a founding member of Silver Jews that same year, he deejayed. Starting as a Central Virginia-based high schooler, he and his pal Norty Hord did the Heaven Up Here show at University of Richmond’s WDCE. Nastanovich moved on to University of Virginia where he was a DJ and station manager at WTJU in Charlottesville during an era in which David Berman, Stephen Malkmus, Gate Pratt, James McNew (Yo La Tengo), artist Steve Keene, John Beers (Happy Flowers) and writer Tom Frank also spun vinyl there. In recent years, Nastanovich has entertained with his record collection at bars and clubs in London, Manchester, Hull, York, New York City, Nashville and Mexico City. He does a monthly gig at The Red Monk in Des Moines, his current hometown. This entry was posted in Uncategorized and tagged Bob Nastanovich, Chicago, Pavement, schwervon live, The Owl. Bookmark the permalink.